By Bridget Kennelly, English Teacher Mentor in Kiribati. The long 6-month planning, preparation, farewells and slightly apprehensive anticipation of my upcoming placement in Taborio, Kiribati saw me board the plane in Adelaide on Wednesday 16th January with mixed feelings. I then transferred to the International terminal in Sydney for my flight to Fiji in a rush and crawled into bed in Nadi, after 2 flights, too exhausted by the enormity of the day, yet knowing I had to be at the airport at around 5:30am in the morning for the final leg to Kiribati. However, my very overtired body had other ideas! I woke up in a panic at around 8am (after the flight to Tarawa had well and truly left)! After some desperate messages to Christine to alert the Kiribati people meeting me, it was all sorted. As there are only 2 flights to Kiribati per week, I booked into a backpackers hostel and spent the next 4 days sleeping, reading, going for walks and mentally preparing for Kiribati. As I mentioned to several friends and family, “The missed flight was meant to be” as I was far more settled emotionally after the R&R days. On the Monday morning, keen not to make the same mistake, I was the very first to check-in! After a 3 hour flight I finally arrived in Tarawa! I was met by some OLSH Sisters who accompanied me back to the convent at Taoereraoke. 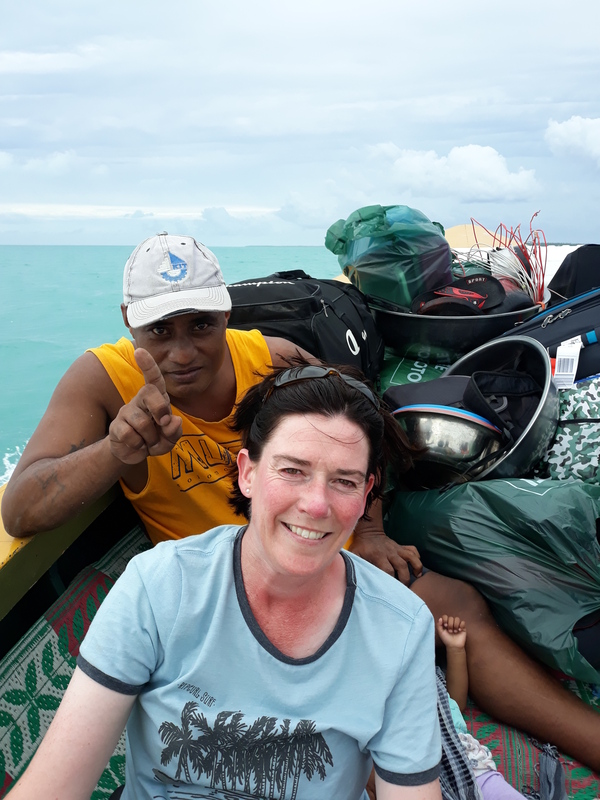 I immediately felt the Kiribati hospitality and generosity that had drawn me to apply for this placement and the hustle and bustle and stress of the busy world I had left began to dissipate. It was a special time for the OLSH Sisters, as they were all together for their Chapter and I was welcomed into their community with open arms, joining them for daily meals and Mass until Wednesday when I was thrilled to stay with old friends, the Good Samaritan Sisters at Temwaiku. On Friday I returned to the OLSH Sisters to cross the lagoon to Taborio, the final leg of the journey. Bridget crossing the lagoon to Taborio (with a small cameo from an iKiribati baby). Upon arrival at the edge of the lagoon, the sight of such a precariously packed boat was one to behold! I’m not sure if I was more concerned about my belongings toppling into the lagoon or the waves we were going over in the school boat. However, I have learnt in Kiribati that to worry is not a useful thing so I just went with it and arrived about an hour later at Taborio, everything intact, albeit slightly wet! I was glad to be able to finally unpack in my ‘new home’. Being in the school compound of Immaculate Heart College, all the other teachers are nearby and very helpful and kind. After only 1 night here, I know the next few months are going to be full of new experiences in daily living, teaching, hopefully learning more iKiribati language and acclimatising to a very different climate and I look forward to meeting new challenges head-on… and letting go of the stress of the western way of life that now already feels a million miles away! While Bridget dries out her gear, you can support the staff and students at Immaculate Heart College by donating to their project. There is both a moral and social responsibility attaching to these experiences of foreign cultures, and if nothing awakens in our own soul, making claims and demands upon us, calling us to change the way we live, then we have been merely parasites and invaders.